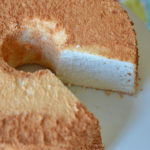 On Monday I shared with you a recipe for Angel Food Cake. Today, I’m giving you one of the many great ways you can serve it. My favorite way is topped with mashed strawberries and whipped cream. It’s very simple and doesn’t require an exact recipe. Just chop up some fresh strawberries (frozen works as well), sprinkle in a little sugar with a splash of lemon juice, then mash up with a potato masher. 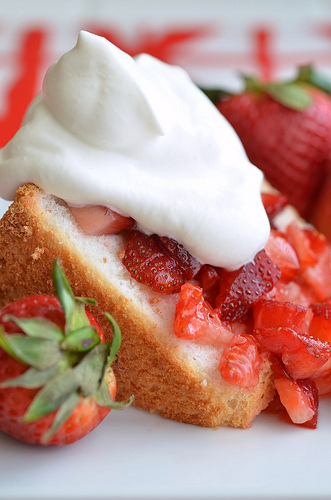 Slice off a piece of cake then drizzle with strawberries. 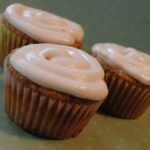 Finish with a dollop of whipped cream. Yum, yum! I’m having a bbq with few friends on Saturday and as soon as I saw the angel food cake recipe I decided I was going to make that and add strawberries and whipped cream. Seeing your picture here makes me sure that it will definitely be the right choice! 🙂 Thanks for the recipe! 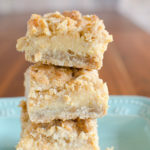 This is one of MY favorite desserts too!! So light and yummy. Love your photo, it’s gorgeous!! 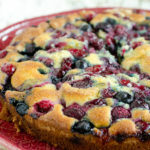 Do you think using the Truvia baking blend would work?